Sandwiches are a great way to enjoy an easy and quick meal on the go. 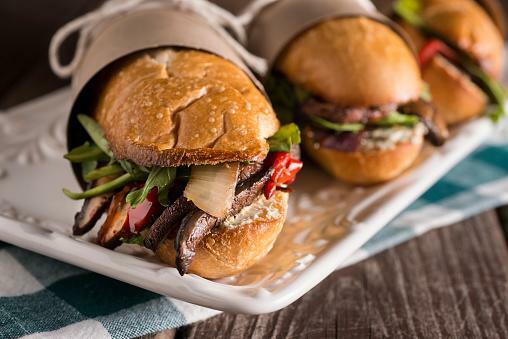 These sandwiches are vegan and packed with flavor and nutritious ingredients you're sure to love. 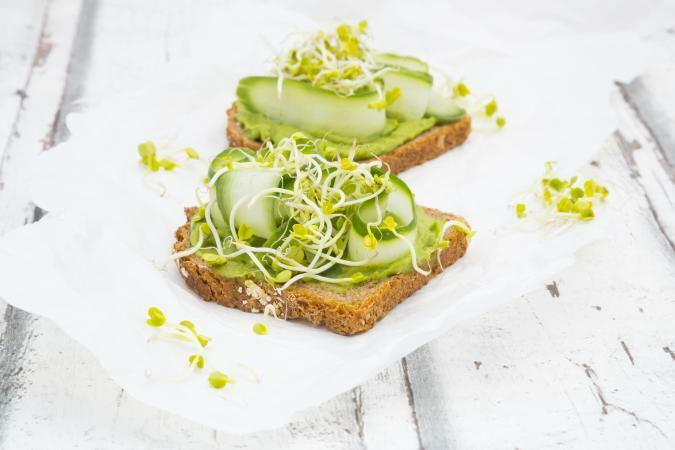 Use a good, seeded vegan whole grain bread for this simple sandwich, such as Dave's Killer Bread 21 Seeds and Whole Grains Organic Bread. It makes two, open-faced sandwiches. In a small bowl, mash the avocado with the lemon juice, salt, pepper, garlic and smoked paprika. Spread the avocado mixture on the two toasted bread slices. Top each with half the cucumber and half the sprouts. This makes two, good-sized sub sandwiches. It's a warm, hearty sandwich you're sure to enjoy. In a large skillet, heat the oil on medium-high until it shimmers. Add the mushrooms and onions. Cook, stirring occasionally, for about five minutes - until the mushrooms and onions start to brown. Add the red pepper and salt and cook, stirring, one minute more. Add three garlic cloves and cook, stirring, for 30 seconds. While the vegetables cook, in a food processor combine the basil leaves, mayonnaise, remaining 1 garlic clove, and lemon zest. Process until the basil is chopped, about 10 to 20 one-second pulses. Spread on the toasted sub rolls. To each roll, add half the mushroom mixture and half the arugula. 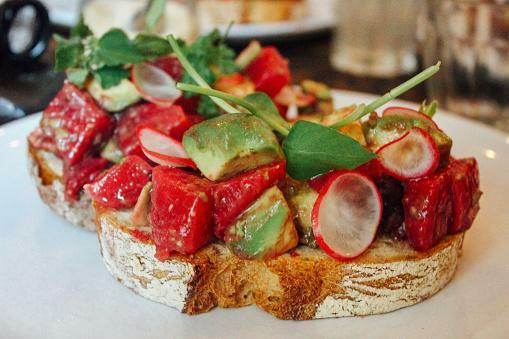 This fresh and vinegary sandwich is delicious at the height of summer when tomatoes have reached their peak ripeness. Use fresh garden tomatoes here for best results. This makes two sandwiches. In a medium-sized bowl, whisk together the vinegar, salt, pepper, and garlic. Add the basil, tomato, and radish and toss to combine. Allow to rest for 20 minutes. Remove the vegetables from the liquid with a slotted spoon and set aside in a medium-sized bowl. Add the avocado. In a small bowl, use two tablespoons pickling liquid and whisk together with the olive oil and mustard. Toss with the tomato mixture to coat. Rub the toasted bread with the garlic cloves to scent it. Spoon half the tomato mixture over each slice of bread and top with fresh basil for garnish. Eating sandwiches can bring variety to a vegan diet, and there's plenty to enjoy with these recipes. Try these or come up with unique creations for a delicious and quick meal.